Our mission is to serve our members and the industry by encouraging the sharing of knowledge and advancing the design, development, manufacture, application, operation and maintenance of reciprocating internal combustion engines, gas turbines and their related fields. We strive to be the place where all involved in the power and engine industries can develop their knowledge in the field of diesel engines, gas engines, gas turbines and related technologies. You are invited to be part of IDGTE. Join a unique professional organisation dedicated to your industry and extend your Continuous Professional Development (CPD) by participating in IDGTE meetings, technical visits and networking opportunities. Join now: As a Member you get access to the on-line library and receive past technical papers published in the Power Engineer free of charge. Pay no registration fee. It is intended that the programme includes topics of interest to our membership and the industry worldwide. In 2018 we plan to continue delivering high quality papers days as well as our seminars and conferences. The theme of these events will include current and topical subjects relevant to members, plant users and today’s reciprocating engine and gas turbine industries. We invite you to send in your ideas and get involved in the organisation of these events. You are invited to propose papers for consideration. Your help is welcome and needed. To be part of the programme please contact IDGTE Bedford office with your comments now. IDGTE needs people to volunteer to take on various very rewarding tasks that open opportunities for personal development and achievement of CPD. If would like to become an IDGTE Ambassador please contact IDGTE Bedford office. at 10.00am with a seminar, followed by a 3-course luncheon and guest speakers in the afternoon. something which is relevant to everyone’s business. Dallas Campbell,TV Science Presenter, Writer and Broadcaster. 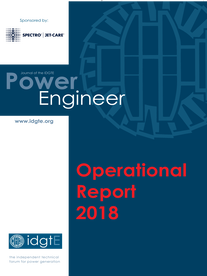 The invitations for submission of returns has resulted in IDGTE receiving data for 231 reciprocating engines and 45 gas turbine installations over 59 sites worldwide. The 2018 report is to contain data for the years 2015, 2016, and 2017. We have received 445 data sets for recip engine plants and 117 data sets for gas turbine based plants. A draft report will be made available to members only before the meeting and this will discuss the statistics from these plants an operational experiences reported. Members and guests are invited to register for the event now. Cranfield University has kindly offered to provide facilities and host the event and we need to reserve the limited number of places on a first come first served basis.